Hello my friends, and welcome to this week’s Prayers for the Week post. We have turned the corner, we are fully involved in the year 2014 — but is it possible that we are carrying some baggage that we should shed from 2013, or even 2012, 2011, 2010, or even earlier than that? 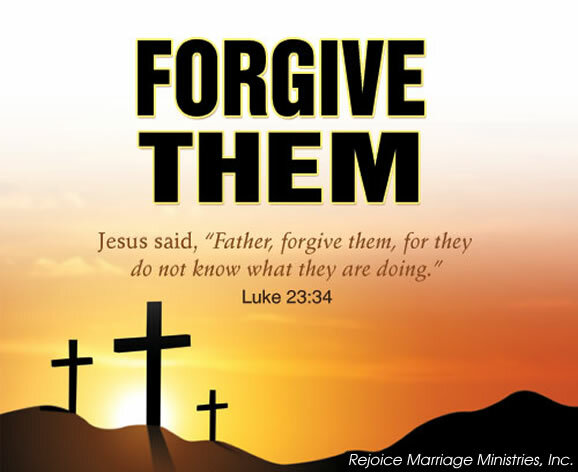 Is it possible that we need to forgive someone? Is it possible that you need to forgive yourself? My friends, I’m going to share with you a quote I read when I was researching an image to use for this post. Forgiveness is not something we do for other people. We do it for ourselves ~ to get well and move on. My friends, I believe a truer statement was never said. Failure to forgive is to keep a bitter pill in your heart, and that pill will grow and grow and grow if you let it, until you end up becoming a bitter person. It changes your outlook on life. It makes you angry a lot, it turns you into a cynic, it causes you to just be someone that no one wants to be around except other bitter people. My friends — it is very important that we learn to forgive. Failure to forgive leads to a hardened heart, and that keeps you away from God. My friends — please forgive if you have some baggage to get rid of. It will be the biggest thing you ever do. Now, please read and pray for these requests and praises. Thanks! Starting us off is my friend Ivon. This story is sad and full of pain, so please make sure you pray for all involved. My friend Ivon left a prayer request on Facebook. Here is what she wrote:To everyone of my friends & family.. Please I ask you all for a very special prayer tonight! I’ve just gotten word that someone that is extremely near & dear to our hearts has been involved in an accident and we don’t have any further news from FHP. My heart aches and it saddens me so much to have to share this news. Today we lost someone extremely Dear to all our hearts. I ask please that you keep my Bestfriend, Renee’s family in your prayers. Her 19 yr old daughter, Savannah, whom was like my niece, passed away in a terrible car accident. Please, pray that they may find strength to deal with this tragedy. RIP ‘Pumpkin’ you may be one of God’s angels now but you will never be forgotten. Heavenly Father, we know that you are now embracing Savannah in Your loving arms, and that she is in no pain or suffering. That thought alone gives us comfort. However, there are a lot of grieving family members and friends right now that need You to lift them up, to carry them during their intense grief. Please carry them, please hold them close, please give them Your Peace, Comfort, and Strength to deal with this tragedy, and to remember Savannah for the loving, caring person that I know she was. We ask these things in the name of Your Son Jesus, who carries us whenever we call on Him. Amen. My friend Vickie has a prayer request. Here is what she wrote on Facebook:Please keep my daughter and me in your prayers and thoughts today. God knows the reason. Vickie, the Lord will keep you under His care today, and knows the reason even if we don’t voice it here! It’ll be okay! Please continue your prayers for my Cousin Barb’s husband Tim. He has been battling cancer for almost a year, and it is taking a toll on him emotionally. Please pray for his healing, of course, but also for his Peace, comfort, and strength. Please also pray for my Cousin and all of their immediate family. Thank you everyone! Please pray for their Peace, Comfort, and Strength and that they will turn to God for their needs. He will comfort them and they will be at peace knowing that Uncle Dave is now in Jesus loving embrace! We started the day with nothing new to report, no progress made and nothing new to be worried about. He was fine all morning and he headed into surgery a bit ahead of schedule. The doctors continue to repeat that not worse is good. I’m waiting to hear about something better. The surgery went well enough. They completely removed a lesion on his shoulder that was filled with necrotic (dead) tissue. It is the size of a clementine orange, so we are likely going to have issues with it healing. They also removed two lymph nodes in his armpit from a bundle of nodes. This was much easier than expected and the surgeon closed it nicely. Surgery was a success from our perspective. Ben’s blood pressure tanked in the evening and we had to do a variety of things to bring it back. The most likely cause is that we were too aggressive on the Lasix which pulls fluid off of him. That may have thrown his other numbers into trouble which caused him to have low blood pressure. It has now stabilized, but we are very worried. There are no updates from any of the biopsies today. We can only hope for results sooner than later. Please remember to not talk about this with the twins. Not only do they not know any information, but we are also trying to keep their lives fairly normal. Prayers of patience for me would be a good thing. I feel very short with some of the staff around here. I know that they are trying to help, but I am frustrated with their lack of answers. Our Heavenly Father, we know that you are in control of all that needs to be done with regards to little Ben and his family. His Mom Jenny, who has been updating us, needs your Peace, Comfort, and Strength to continue. She also needs Patience as she is seeing herself becoming short with the doctors and nurses treating Ben. Lord, please work Your healing touch upon Ben, but additionally, work Your healing upon all of the family, because these kinds of situations can lead to more hurt than exists just with the patient. Lord, thank You for hearing our prayers for Ben and his family. I know that it means the world to this family that they have prayer warriors around the country and world praying for them. Lord, I especially want to thank You for the gift of Your Son Jesus. Without Him, we all would be lost, despite our health. Lord, hear our prayers, and look after Ben and his family please. It is in the name of Your Son Jesus that we pray every day with Thanksgiving. Amen! Putting others before you — that’s what Mitchell did in this post on FB. This is both a prayer request — for the homeless around the country and the world — and a praise, that one person sees the blessings he has. God Bless you Mitchell, and I’ll pray for you to get the job you need! Here is what he wrote:I feel sorry for the homeless person who sleeps in a doorway at a Dr. office across the street every night. I may not have a job, but I had a lot of peanut chocolate candies and Craisins packages that we got from Mickey’s Halloween party at the end of Oct. So I put them in a bag and put it on that doorway for the person. I know its not really healthy, but its something. My good deed for the day. My last Praise this week is for all of the teachers, administrators, and workers that care for the wellbeing of our children. They — and God, especially — know who they are, and the number is greater than I could ever list. For all of you, I take a moment and give thanks to you all and lift up all of you in Praise to my Lord. Your’s is a special calling, and one that not just anyone can do — a lot of people think they can, but those are the ones that just aren’t very good at it. So, to all of you, from the bottom of my heart, I say thank you for loving our children enough to care about what happens to them. My friends, if you have someone to forgive — even if it is yourself — I urge you to do all you can to achieve that feeling of forgiveness. Please, try hard to do so — and I think you will find that your whole outlook on life, and how you feel about yourself, will improve almost exponentially. Until next week, please pray for these requests and praises, and please feel free to share any requests you have with all of us. We are here to pray for you too, so share your requests and we’ll pray for them. May God keep you safe from harm, and bring you back to us next week for our next Prayers for the Week post! Amen.